The Federal Reserve did nothing when LIBOR exploded in 2007 (chart at the end of this article). But since then, the Fed has taken the four steps listed below. The result of these steps will be a slow economy going forward. Jeffrey Rogers Hummel recently posted an article spelling out the relationship of the Fed to banks and the government. I have no clue whether his main argument is valid although we know the Fed is paying banks 12 billion dollars in 2016 in interest on reserves (IOR). That seems like real money to me. 1. Grumpy's (Grumpy is John Cochrane) friend says the Fed can't afford to pay the treasury interest if rates are significantly raised. That is almost a hostage situation. Clearly, the Fed does not want to repeat the explosion of LIBOR, ever again. 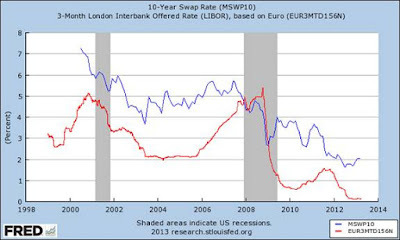 The chart at the end of this article shows that LIBOR was on a collision course with the Swaps Rate in September, 2007. The Fed could have lowered interest rates before that LIBOR line crossed the Swaps line. Once LIBOR and Swaps crossed, it was curtains for interbank lending. And swaps were placed at risk that were based on the banks taking floating LIBOR and the counterparties taking fixed high rate. Sumner and his friends believe the Fed was too tight during that time. There could be some truth to that, knowing that the Fed paid IOR (interest on reserves), which slowed the money supply and growth, to be sure. But one wonders why the Fed did not attempt to reduce the LIBOR explosion that predated those reserves being put into place? Turns out, based on the chart again, the Fed was way too tight even though it knew that the economy was at risk by simply watching the explosion of the LIBOR rate in 2007. I think the Fed wanted to experiment with the economy and this crash was done on purpose. That is my opinion only. Yet, economists don't take into account that decisions by the Fed protect the banks first and economy second. And they don't take into account that the Fed keeps rates low to protect the banks, even more so as the new clearing houses for derivatives requires even more bonds as collateral than ever before! Economists think that the Fed wants banks to make money on higher interest. That used to be true, but it may no longer be central to bank stability. The Fed clearly has the dual mandate to 1. protect the banks and 2. to create demand for bonds no matter what the impact on main street. ...Those (treasury) bonds are being hoarded and long bond yields will be pushed down forever by this plan, or conspiracy or whatever you want to call it. Long bonds no longer react to expected measurements. CATO and most economists are blind to this new reality. Supply and demand of bonds in those markets is a worthy topic for economic study yet none of you seem to want to do it. I am not an economist so you are going to have to do it. If you never do it it makes people like me question the veracity of your profession. It has been said that a nearly a trillion to 4 trillion dollars worth of bonds are needed in the clearing houses for collateral. And then consider that if bonds were to go up in yield there would be margin calls on the collateral, and even more bonds would have to be hoarded. The firms who are counter parties don't know interest rates won't likely go up by much, because of actions by the Fed and the demand created for bonds, so they buy extra bonds. The Fed really did it this time. The Fed is (also) in the business of keeping interest rates low, by backing the banks as they bet on low floating LIBOR and pass the fixed swaps rate to the counter parties. Put the two together and you wonder why we will never see strong growth in the economy for as long as we are alive! Perhaps I exaggerated there. But it would be interesting to see growth going forward for the next 20 years. The way things are set up now, it seems as though major growth in the economy is going to be difficult. And it seems that as the crash was allowed to happen, with the full knowledge of the Fed, a slow economy is being set up with the full knowledge of the Fed! 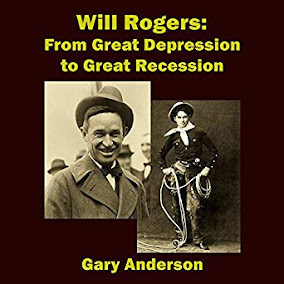 One more related issue regards the Sumner/CATO cabal and its desire for rapid economic growth. These economists spend a lot of time blogging about the need for easier loans and easier zoning, in order for growth to take place. But those loans hurt a lot of people. Germany grows without allowing toxic loans for its people. German home ownership is below 45 percent and rent controls are in place. Of course, as I wrote on Business Insider a long time ago, the German banks loaned money to the periphery with easy terms. Must be nice to be in the protected group. Here is the chart showing that at the exact time when LIBOR crossed the Swaps rate, the financial crisis began the recession. By the way, you always have to keep in mind that the Fed had access to this Swaps and LIBOR data. One wonders why it didn't act to lower interest rates much sooner.